SHERRI BETZ, PT, DPT, GCS, CEEAA, PMA®-CPT is a 1991 graduate of the Louisiana State University Medical Center's School of Physical Therapy and received her doctorate in physical therapy from Evidence in Motion Health Sciences Institute. Sherri actually began her movement career as a national gymnastics competitor and as a group fitness instructor and personal trainer for Nautilus Fitness Centers in the 1980's. Inspired by the work of a physical therapist in one of the clubs where she trained, Sherri pursued a degree in physical therapy. Her love of movement education has been integrated into her physical therapy practice at a rehabilitative level and at a fitness level. Utilization of Pilates, Yoga and Gyrotonic® with a specialty in the treatment of the pelvic girdle and manual therapy of the spine and pelvis are integral in her practice as a Physical Therapist. Selected to serve on the Foundation for Osteoporosis Research and Education (FORE) Professional Education Committee and the NOF Exercise and Rehabilitation Advisory Council, Sherri is involved in improving awareness about bone health for the lay public, exercise teachers and for healthcare professionals. These committees review the latest updates in research, develop guidelines and design educational programs for physicians and allied health professionals. She has developed the Do It Right and Prevent Fractures Booklet for FORE/American Bone Health. Sherri has been the physical therapist for the San Jose Sharks Professional Hockey Team, nationally ranked pairs and singles figure skaters, and elite-level gymnasts in their rehabilitation and in development of their Pilates-based training programs. Geriatric Clinical Specialist, certified by the American Board of Physical Therapy Specialties and as an Exercise Expert for Aging Adults, Sherri specializes in exercise programs for older adults. She teaches community-based classes for osteoporosis, balance and fall prevention for older adults at the Capitola Recreation Center, serves on the Board of Directors of American Bone Health and hosts the American Bone Health Lecture Series-a support and seminar group in Santa Cruz. Sherri promotes healthy exercise for older adults in her role as Chair of the American Physical Therapy Association's Bone Health Special Interest Group. Sherri was the Vice-President of Polestar Education and was a Polestar educator and examiner from 1999-2014. 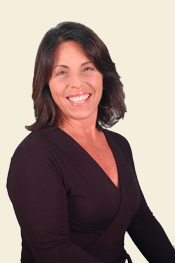 Sherri is also certified in Gyrotonic® and GyrokinesisTM. Extensive research on the treatment and prevention of Osteoporosis and Osteoarthritis led to the publication of the The Osteoporosis Exercise Book: Building Better Bones, 2nd Edition with integration of Pilates and Physical Therapy principles and exercise modifications for those at risk for fracture. Sherri has produced the following DVD's: Pilates for Osteoporosis Exercise Program Prenatal Pilates, Dealing with Acute Low Back Pain, Pilates for Seniors, Pre-Pilates for Rehabilitation, and Reformer for Osteoporosis. Studies with Ron Fletcher and Kyria Sabin inspired her to become licensed in Fletcher Pilates Towelwork® and Fletcher Pilates Spine Corrector®. She is a graduate of the Ron Fletcher Program of Study. 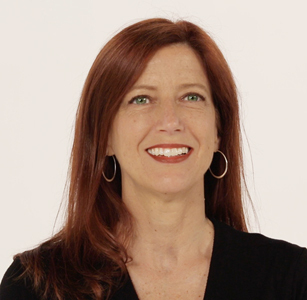 Sherri is the proud recipient of the Deborah Lessen Award for her outstanding service to the Pilates Method Alliance. She was the Vice-President of the Pilates Method Alliance and served on the PMA Board of Directors from 2003-2009, became PMA Pilates Certified in 2005 and served on the PMA Pilates Certification Exam National Panel to improve the quality of Pilates Instruction. Sherri currently is the PMA Research Committee Chair and served as the Chair of the PMA Certification Board from 2013-2016. • to inspire and assist people in movement without pain. • to change faulty habitual patterns of movement and create new healthy patterns of movement. 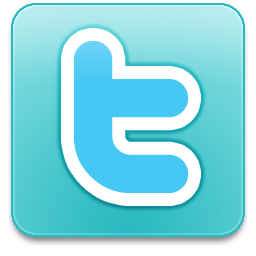 • to provide low cost, long-term exercise programs for older adults. • to teach people to stand tall through out the lifespan! • to inspire joy in movement! Call 831-359-5184 or email TheraPilates to schedule a phone consultation with Sherri. LAURA DUNN, PT, PMA®-CPT graduated from Cal State Northridge with a BS in Health Science followed by a post professional degree in Physical Therapy in 1993. She then completed a year-long manual therapy program in 2000 followed by studying Pilates with Physical Mind Institute in 2004. She is a PMA® certificed Pilates Teacher. 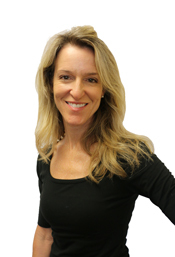 She has extensive continuing education experience including: cerfication in Active Release Technique, and completion of Osteoporosis Rehabilitation programs by Sara Meeks and Sherri Betz. Laura offers a unique holistic approach considering the "whole person" along with an integrated clinical approach to find the best strategy for optimal outcomes with her clients and patients. She utilizes an eclectic set of tools in order to find what works best. When Laura isn't helping people feel their best, you can find her either: running with her dog-Koa, road biking, mountain biking, surfing or skiing! Email info@therapilates.com or call us at 831-359-5184 to schedule a Pilates Physical Therapy session with Laura. MICHELE FRANZELLA, PMA®-CPT is a Certified PMA Pilates Teacher and a 2004 graduate of Polestar Pilates Education. She completed Polestar Pilates Studio training in 2004 and also assists Sherri Betz with the Polestar Pilates teacher training program and Osteoporosis courses. Michele is a Polestar Pilates Educator and is a fantastic mentor in coaching students as they prepare for their Polestar Pilates examinations in the teacher training program. Michele strives to teach excellence and precision movement to all her clients. She has taught TheraPilates Mat Classes at Cabrillo Fitness Club, Toadal Fitness, 24-Hour Fitness, Plantronics and Courtside Club Los Gatos. She teaches a fabulous Pilates Apparatus Class at TheraPilates that any level client can participate in! 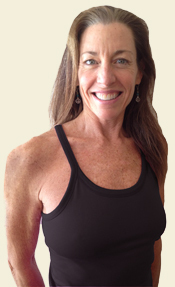 Michele comes from a fitness background and brings her positive outlook and high energy enthusiasm to our Pilates Team. Check the TheraPilates Group Classes page for Michele's Quartet Classes on Wednesdays at 10:00am and 11:00am and you can call Michele to schedule a Private Pilates session at 831-359-5184! Teresa Moorleghen, Pilates Teacher is an incredibly experienced Pilates teacher who received her Masters of Science in Kinesiology from A.T. Still University in May of 2017. She is a Qualified Teacher of Fletcher Pilates (2003), Certified Pilates Instructor of the Pilates Method Alliance (2007), and a Certified Yamuna Body Rolling Practitioner (2006), and a graduate of Pacific University with a BA in Literature. She worked as a Pilates teacher at Body Works Studio in Tucson, AZ, Fletcher Pilates International Headquarters from 2003-2005, and at Studio 4 Pilates in Half Moon Bay, CA from 2005-2010, until opening Coastline Pilates in 2010. From 2008-2009 Teresa served as Faculty for The Ron Fletcher Program of Study. During her work with The Ron Fletcher Program, she met her longtime mentor, Pat Guyton (Pilates Conservatory). She also worked as a Physical Therapy Aide and Pilates and Body Rolling instructor at Welhab in Watsonville, CA from 2008-2009. Teresa's study of movement began with gymnastics and dance as a child. She worked with local and nationally touring dance and theater companies as performer, teacher, choreographer, and movement coach from 1997-present. Her experience includes performing in the San Francisco Bay Area with Moving Arts Dance Collective and Last Planet Theater. While living in Tucson, AZ she performed with the flying modern dance company, ORTS Theater of Dance, and Flor De Liz Dance. 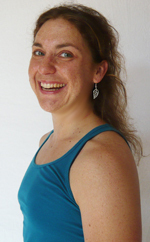 She has been teaching and composing for Agape Dance Academy in Scotts Valley since 2012. She also contributed to Pilates Take Out: 10-20-30 Guide to Fitness. Teresa is incredibly gifted at working with a wide range of age groups, from teen to adult. You will be delighted by her intelligently crafted lessons! You can call Teresa to schedule an Apparatus or Private Pilates Apparatus session at 831-359-5184! Email Teresa at TheraPilates to schedule or with questions. 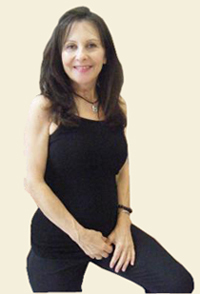 Dorothy Raftery, Pilates Teacher is one of our most experienced Pilates Teachers trained by Marie-Jose Blom of Long Beach Dance Conditioning and Rael Isaacowitz in the late 1990's. Dorothy is also a Tibetan Yoga Teacher and a masterful group exercise teacher utilizing unique and creative cueing to help each student reach deeper within to connect body and mind. She teaches with passion and devotion in each and every session to make each client feel special and cared for. Dorothy received her Bachelor of Arts in Theatre with an emphasis in Dance from California State University at Fullerton in 1987; concurrently studying Hatha Yoga and Holistic Health during her time there. Dorothy went on to dance and teach professionally, including theatre and television. In 1997 she learned to teach the Pilates Method under the tutelage of master movement specialists Marie Jose-Blom and Rael Isacowitz. After successfully completing the teacher training program she was asked to teach at her training facility, Long Beach Dance Conditioning. Dorothy moved to South Lake Tahoe in 1998 and started a family. She initiated the pilates mat classes at Lake Tahoe Community College and trained aspiring teachers. In 2004 she began her study of Tibetan Heart Yoga which emphasizes the subtle body, breath and thoughts in connection to health on all levels (physical, mental, psycho-spiritual). She incorporates a cross disciplinary style including Pilates, dance, yoga, Qigong, sports, aquatics and meditation all infusing her practice. Dorothy's most important professional goal is to teach her clients the foundational relationship between conscious, consistent breathing and balanced movement to achieve rapid healing and higher levels of wellness. You can call Dorothy to schedule an Apparatus Class at 831-359-5184! Email Dorothy at TheraPilates to schedule or with questions. Gina Enriquez, Personal Trainer is a certified personal trainer with the American Council on Exercise. With a strong background in the physical sciences, she has taught exercise programs for Community Hospital of the Monterey Peninsula for the last 10 years. Gina was also trained at Stanford to be a master trainer of the Chronic Disease Self Management program, which she has taught for the last 8 years at the Community Hospital of the Monterey Peninsula (Living Well With A Chronic Condition). She serves on the Board of Directors of American Bone Health (americanbonehealth.org) and is co-chair of the ABH Santa Cruz/Monterey Chapter. Gina teaches our TheraPilates® bone safe exercise classes at Capitola Recreation Center and at CHOMP and Sunrise Senior Living in Monterey. Gina currently lives in Pacific Grove, CA and has two grown daughters, Diana and Mia, who both graduated from UC San Diego. Sign up for classes with Gina at www.capitolarecreation.com! A massage with Kelly Meyer, Licensed Massage Therapist, will get to the root of your chronic pain by reducing stress, easing muscle tension, improving structure and restoring function. What keeps her clients coming back is her nurturing and uplifting spirit that always leaves them feeling rejuvenated and rehabilitated. 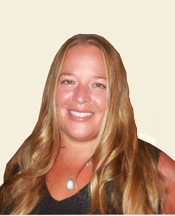 Kelly has over 20 years experience working in both clinical and spa settings. She specializes in clinical deep tissue, orthopedic and sports massage and has dedicated her practice to working with clients who suffer from chronic pain and sports related injuries. Kelly is passionate about the healing arts and has dedicated her studies to both Western and Eastern medicine. She graduated from Twin Lakes College of the Healing Arts in Santa Cruz, Ca. with over 1,000 hours of instruction with multiple massage modalities. Kelly holds an A.S. degree from Cabrillo College in Health Science and Community Health and a B.S. degree in Public Health from UCSC. She had the opportunity to complete a clinical internship at a rural health clinic in Nayarit, Mexico where she lived and worked in the community as a public health advocate and community health educator. Her most recent accomplishment includes a clinical internship at an inpatient rehabilitation hospital working with Physical and Occupational Therapists. Currently, she is working on her goal of studying Osteopathy at the National University of Medical Science. "Beatrice" is our official Studio Greeter. She thinks all of our clients are coming just to see her! 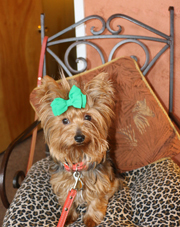 Bea is a rescue Yorkshire Terrier that ran out into the street from the front yard of her Foster home to jump into our lives! She loves her job and takes her greeter role very seriously, expecting petting from every client. She will usually jump up on a chair so that you don't even have to bend over to pet her. Be sure to hinge at your hips and stay in your neutral spine position to pet her! "CALI" was our former Studio Greeter. She was shy, but after you came to the studio regularly, she was thrilled to see you! She brought a smile to everyone she met. Cali passed away at age 14 on July 25, 2013. Cali had a great life traveling the world with Sherri. 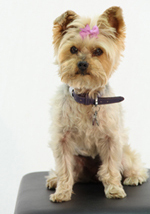 She loved being the Doggie Ambassador, bringing smiles and joy to everyone around her! If you would like to see all of the places Cali traveled, you can view Cali's Facebook page.